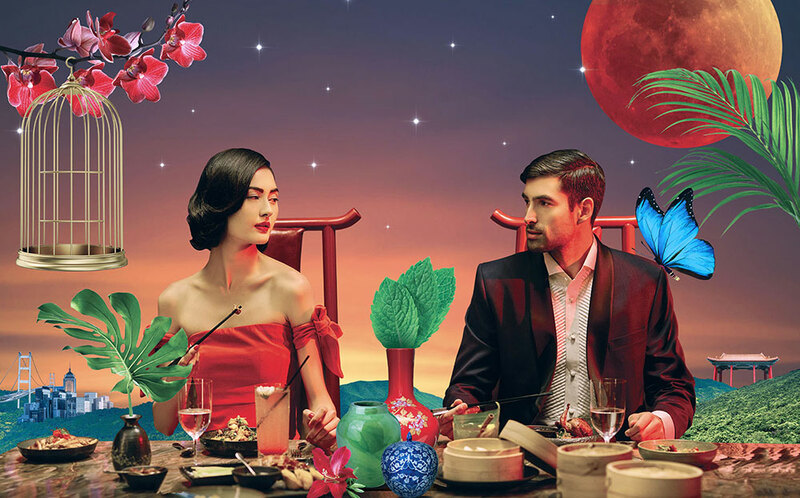 A re-interpretation of the culinary celebration that is the Hong Kong nightlife, created for the launch of The Hong Kong Club at Andaz Delhi, by Hyatt Hotels. A palate that's reminiscent of the good times - on street, on the riverfront and inside the tightly filled brew-pubs. Transcending borders - culinary, cultural and visual. Inspired by the energy and striking contrasts of Hong Kong, this multi-level space offers a bar, club and lounge, featuring dramatic modern Chinese interiors that reflect deep chinoiserie. Dissimilar colours and classic references that create a sense of drama within the venue’s modern contemporary setting worked for us as inspiration to create the mood board for the launch of The Hong Kong Club. After everything, the stories and the songs, you might still leave Hong Kong, but Hong Kong will never leave you. Hong Kong would leave your box of memories crammed full, with thoughts spilling over every once in a while. Step onto the ascend to heaven in front of you, have a slice of the Eastern Sun.